Take a stunning trip to India and Nepal and experience two of the most interesting and colorful countries in the world! Explore the famous Taj Mahal, take an exhilarating elephant ride to Amber Fort, float down the Ganges during a boat ride at sunrise, visit Durbar Square in Kathmandu, among many more exciting activities during smarTours’ adventure to India and Nepal. Tour guide Jasvir Saurana has been one of the best I've experienced in my 14 escorted tours over the years. He is knowledgeable, organized, experienced and most of all proud of his country. Being born of Indian parents but never visiting this awesome country until now, I had only minimum knowledge of this magnificent country with all its grandeur and history. Jasvir opened my eyes to so much more with his detailed explanations of India and Nepal in all their majesty. He is very caring and generous with his time and I'm grateful that I was a participant in this journey. Accommodations, transportation and incredible staff made my trip amazing and incredible. I compliment SmarTours for this great experience and would certainly travel with them again.Three Cheers for SmarTours and 10+ for Jasvir Saurana.Namaste. Your exotic journey to India and Nepal begins this afternoon as you depart the U.S. This morning, see New Delhi’s highlights: The 12th century hand carved Kutab Minar, the Birla Temple and the India Gate. Later, a tour of Old Delhi takes you to the memorial of Mahatma Gandhi and to the Jamma Masjid, India’s largest mosque. 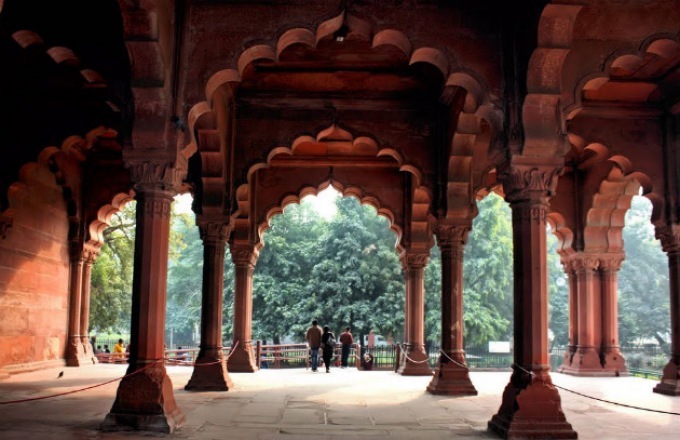 See the magnificent Red Fort, built in 1648 as a symbol of Mughal’s power. Later, enjoy a guided walking tour to Connaught Place downtown and explore the local shops/markets. This evening, your tour director hosts a welcome dinner. Enjoy a walking tour as well as a rickshaw ride in Jaipur’s old city where you will explore the colorful local bazaar. Also visit the Palace of Winds, the landmark of Jaipur. This afternoon venture out of the city to Amber Fort, ancient capital of Rajasthan. See the Temple of Kali, the Hall of Victory, and ride an elephant to the hill where the Amber Fort is situated. Later, attend a unique prayer ritual at a hindu temple. Enjoy a leisure evening in picturesque Jaipur to explore on your own or perhaps enjoy a trip to Jaipur’s spice markets. Day 7: Taj Mahal/Agra Fort Excursion. The highlight of this morning’s tour is a visit to the fabled, perfectly proportioned Taj Mahal. This 17th century, white marble mausoleum was built by Emperor Shah Jehan to enshrine the mortal remains of his Queen Mumtaz Mahal. Afternoon visit tothe Agra Fort, a cluster of mosques and palaces on the banks of the river. Later, explore on your own, shop or relax at your luxury hotel’s pool-side. Tour the spectacular temples of Khajuraho, built by the Chandela kings between the 9th and 13th centuries. The temples are exquisitely carved with graceful statues and frieze of Gods and Goddesses. Afternoon at leisure. Morning visit to the major temple towns in the Kathmandu Valley at the foot of the Himalayan mountains. See the gilded copper gate in Bhaktapur (Bhadgaon), a masterpiece. Proceed to the Hindu Temple of Shiva and the Buddhist shrine at Bodhnath. Afternoon at leisure. Your deluxe hotel is conveniently located for independent exploring and shopping. Today, you may experience an optional Mount Everest scenic flight over the breathtaking Himalayas (weather permitting). Later, drive through the captivating countryside to Bhaktapur and see beautiful art and architecture. On your way back, stop at the fascinating Tibetan Refugee Craft Center and visit the temples, pagodas and palaces in Durbar. Tonight join your fellow travelers for a farewell dinner with a cultural performance. Leisure time for last minute pursuits before your flight back to Delhi, where you’ll connect with your late night flight back to the USA. Bid farewell to incredible India. Your memorable journey ends as you arrive the USA this morning.